â€¢ The World Tree is a visual metaphor for the structure of the spiritual world that is found in many cultures around the world. â€¢ The World Tree is not linear – the branches grow up under the roots and support the Underworld from below. 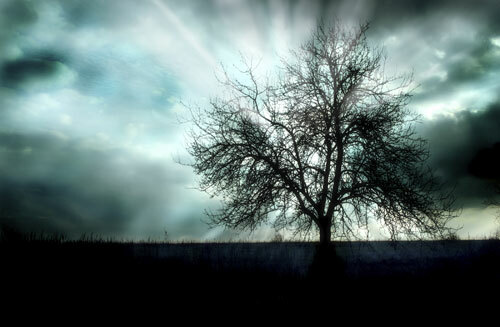 â€¢ Many cultures have captured the experience of the mystic gaining wisdom and enlightenment in the story of him hanging from a tree (The World Tree). This weekend I facilitated a shamanic journey for some friends. While they all made themselves comfortable on the ground, I lit my sage wand until I had sufficient wafts of its cleansing smoke coming off of the end. I stood in the center of our space and connected myself to the Underworld, pulling the dark shimmering energy up into my body. I reached out for the Upperworld and pulled the brilliant white energy down into my crown and into my body, mingling the two energies of the faces of the God. I called to the spirits of the land, asking for their assistance and their support to our process, and finally I called in the spirit guides, ancestors and teachers to be present for this journey. I faced north, and drew the symbol I was given for earth with the smoking sage wand. I pushed the wand through the symbol offering smoke to the spirits of the land in the north. I turned to the right and drew the symbol for fire and offered smoke to those spirits. I then turned to the right and drew the symbol for air and repeated the same process with water for the west. I honored the Light God above, the Dark God below and the Dark Mother that is at the center of all things. With the space properly cleansed and prepared, I sat on a cushion with my drum in my lap and began to lead the travelers on their journey. With a very slow steady rhythm I guided them through a relaxation, counting from 13 down to 1 – each number getting them into a deeper state of relaxation. When they reached 1, I had them visualize the World Tree before them. They took a moment to feel, experience and make a relationship with the World Tree, then when they were ready – they sought out a hole near the base of the tree. The rhythm picked up to a fast dronal pace, and they entered the hole and began their journey. Travelling on the beat of the drum, they journeyed the landscape of the spiritual world, meeting guides, ancestors, having spiritual truths explained to them in visual language, metaphor and surreal experiences. As they journeyed, I stayed present in the physical world, but my consciousness had also shifted into the shamanic state. While I wasn’t travelling I was watching over their bodies, drumming and monitoring the energy. A veil of mist formed over their faces letting me know that they were deep in the midst of their journeys. My hand ached from the continued drumming, but I let the discomfort take me deeper into my own shamanic consciousness. I struggled to stay in the present as my spirit wanted to fly on the rhythm. After about twenty minutes of drumming, I began the call-back rhythm: one loud strike with several quick lighter strikes, repeated over and over again, letting the travelers know that their journey was coming to its end. They found their ways back to their bodies, and at the last strike of the call-back rhythm, I began to speak again. “Return, return… find your way back to your body by the same route you left it. Step out of the hole at the base of the World Tree and give your thanks to the Tree. Touch its bark, feel the texture, smell the aroma, and know that you can return to this place any time you’d like.” I then began a very slow steady rhythm like the one I originally began with and guided the travelers through a count up (1 to 13) in order to bring them out of their trance and into a normal waking consciousness. “Thirteen, you are fully awake and present in the physical world. When you are ready, open your eyes.” The travelers stretched their legs, tightened their fists, wiggled their toes and opened their eyes, returning to the physical world. “How did it go?” I asked. One by one they each told their stories of their experiences. Some saw more than others, some had a harder time getting into the trance than others, but each received and experienced exactly what they needed to in their own visual language. The pervading message between all three journeys was that we had our own power to create our own experience and that we needed to put it to use. I was honored to facilitate the journey and be able to help my MWLM brothers travel the spirit world. The work of a deathwalker is intense and involves spirit contact in order to retrieve lost lore and guidance. Last night I made a visit to my favorite little cemetery. It’s the oldest cemetery in the city and it’s open all night long – no gates, no guards – just dead folk. I paid my 9Â¢ at the entry to the cemetery to honor the Dark Lady and went in. I had two objectives in mind: to connect with the spirits of the land, and to visit the ancestors of Men-Who-Love-Men. First, I picked a nice grassy area in the middle of the cemetery and then did an exercise to merge with the land. This cemetery is special because it lies along a ley line (energy line). The ley lines, for the most part in Southern California, follow the lines of the major faults in the area. It is as if the cracks in the earth allow the energy of the underworld to seep up and radiate out across the land allowing fertility and creation to manifest there. In order to merge with the land, I placed my feet firmly on the ground and called out to the spirits of the land. I asked them respectfully to show me their wisdom and to help me form a relationship with them. I then reached out with my heart and gut down into the earth below me and pulled the energy of the land up through my body. As I pulled it up into my body, I raised my hands on either side to help it move into me. By the time the energy was at about shoulder height, I actually felt not so much as if the land energy was moving into me, as I was sinking into the land. When I pulled the energy all the way to the top of my being and had my hands held high over my head, I reversed the process. I brought my hands down and as I did so, I pushed my energy down into the earth in a sacred marriage between myself and the land. In that merging, I made a relationship with the guardians of the cemetery and the spirits that move through the land in that spot. The cemetery suddenly felt VERY comfortable and welcoming. I then began my process of entering the trance and traveling into the underworld. I started to turn the mill counter-clockwise to open a portal down into the underworld. I walked forward around the circle with my left hand extended toward the center of the circle and my gaze fixed upon the center of all things. As my pace quickened and my breathing intensified, I felt myself starting to tread down into the land. I went faster and faster until at one point I looked up and saw the middle world above me and then collapsed into the center of my portal and let the journey happen. I went to the bonfire in the underworld and visited the Ancestors of Men-Who-Love-Men and they were very happy to see me. I asked them what they thought of the podcasts that I had been doing and they liked them. They told me I’ve given enough spiritual foundation that now the time has come for me to speak about the issues we as gay men face in society and how these spritiual practices can help heal them or overcome them. My podcasts are going to reflect that change a bit more – to show how this is truly a gay men’s spiritual path. When I was ready to return to the middle world I turned to leave but I felt a presence next to my physical body. I heard breathing. I asked who he was and what he wanted. He was the one gay spirit buried in that cemetery who wanted to go up to the Upper World. He was done roaming there. He literally said, “Can I go with you?” and I said yes. I asked my guides to assist me with the process and they hooked him onto my back. I then stood up in my trance and began turning the mill in the opposite direction – clockwise – in order to work my way to the upperworld. I moved faster and faster, around and around until I looked up and saw pure brilliance then I stopped. As the spirit disembarked from my back, I began to spin and get dizzy and stumble about and finally ended up on all fours shuddering as he detached from my energy field. He was glad to go – and my spirit guide took him to his destination. It took me a moment before I came back to physical reality. Mission accomplished. The work of the deathwalker was done.